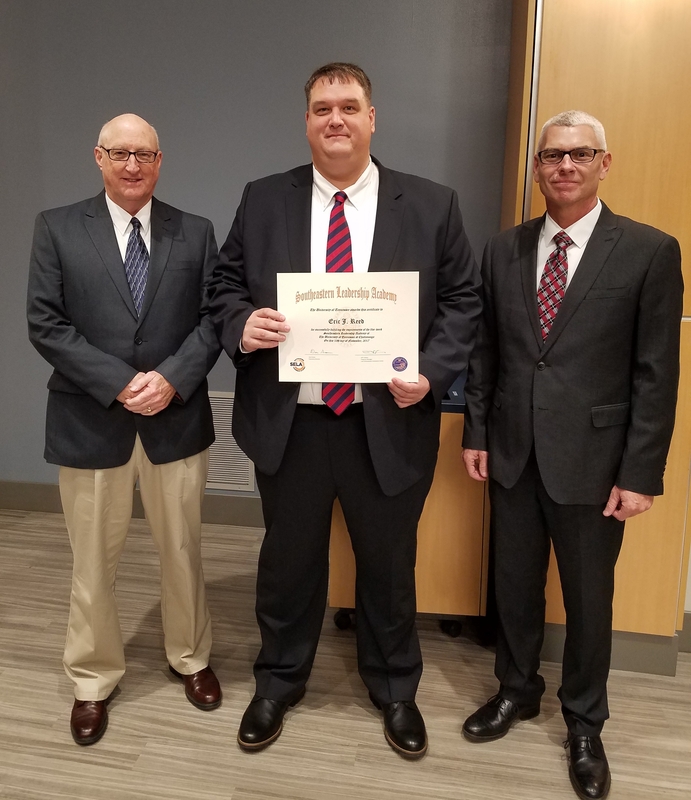 The Martin Police Department would like to announce Captain Eric Reed’s graduation from the Southeastern Leadership Academy this past Friday, November 10, 2017 at the University of Tennessee at Chattanooga. The Southeastern Leadership Academy is a prestigious five-week academy that is held at the University of Tennessee at Chattanooga. It is an extensive leadership school that is presented by the union of UTC and the Law Enforcement Innovation Center. Each week focuses around themed lessons: Foundations of Leadership/Leading Others, Leadership Skills, Building External Relationships, Employee/Internal Matters and Critical Issues. The academy, which is targeted toward middle management, will challenge participants to develop their leadership styles in order to become more effective and progressive leaders. This project is funded under an agreement with the State of Tennessee, Department of Finance and Administration, Office of Criminal Justice Programs and is supported by Award #23123, awarded by the Bureau of Justice Assistance, Office of Justice Programs, USDOJ.